Uber is a form of car for hire service whose business model is somehow similar to taxi services. This is an on demand service that is powered by a smartphone application where a rider can hire private driver to be taken to his or her destination. Ubergo and UberX are examples of car services available that can be hired by customers. However, it should be noted that there are some differences between these UberGo and UberX. The major difference between the two pertains to the aspect of price and there are also other features that make them different. Outstanding characteristics of both UberGo and UberX are discussed in detail below. The main difference between UberGo and UberX is that UberGo offers low cost Uber services. The fares are generally cheaper compared to UberX as a result of the type of car as going to be illustrated in detail below. In terms of the prices charged, it can be seen that the base fare for the first four kilometers is relatively cheaper compared to Uberx and this also depends with your city. The waiting charge for UberGo is also cheaper compared to UberX. The other issue that can be attributed to the low cost of the services offered by UberGo is that it does not include other additional facilities like Wi-Fi that are offered by UberX. UberGo is a 4 seater hatchback car which is comprised of air condition. This is usually a small car though it can carry four people. The space is not large enough to carry excess baggage. Therefore, the users of UberGo service should be aware of the fact that they should not carry extremely huge baggage since they may encounter challenges related to shortage of space. Examples of cars available for this service include Etios Liva, Maruti Ritz and Maruti Swift. UberGo remains the same unlike UberX which can be viewed as both UberGo and UberX. This is caused by the fact that UberGo cars are generally small such that they may not be capable of carrying large volumes of luggage. The other issue is that drivers should be mature enough to operate these Uber services and they should have a good track record that has not been tainted by criminal activities. Drivers are expected to be holders of professional drivers license and they can also work on part time basis. UberX’s services are expensive compared to UberGo by virtue of the fact that it uses cars that are different from the later. The base fare for the first four kilometers is higher than UberGo and the other issue is that the waiting charge is significantly higher than UberGo and this also depends with place such as city. Apart from the type of cars that are used by UberX, the other reason for high fares is that it offers additional services like on board Wi-Fi. The riders can enjoy services like internet surfing while on board to different services. This service is convenient to the riders who may be interested in performing different tasks online while they travel from one point to the other. UberX on the other hand is a 4 seater sedan that is comprised of air condition and it has enough space to carry huge luggage. A sedan is usually bigger than a hatchback vehicle since it is comprised of a large boot that is specifically meant for luggage. It can be observed that UberX on the other hand is specifically meant for passengers with smaller possessions. 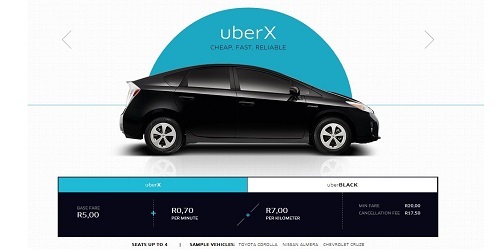 Examples of Uberx include the following: Honda Accord, Toyota Prius, Swift Dzire and Indigo. These cars have large storage space for passenger luggage. The other key characteristic of UberX is that it should have four doors and it should also have five seat belts that are designed for five people. On top of this, it can be noted that UberX can be viewed as both UberGo and UberX. It perfectly fits both models since it has been specifically designed in such a way that it can be converted to UberGo. UberX cars should be 2006 models or something newer. The models that belong to an older version cannot be allowed to offer Uber services. The main reason for this is specifically to enhance passenger safety. Old models cannot be trusted given that Uber services are used by different people from various places hence their safety concerns should be prioritised. With UberX, there are no fears of unnecessary delays due to bad conditions of the vehicles that might be used. Quality is guaranteed through the use of certified and reliable cars that will not easily break down. The other key feature of UberX is that the drivers should be over 21 years of age and these should not have any criminal record. The safety of the riders is prioritised such that people who are mature enough and are viewed as responsible are considered for the task of drivers for the Uber service. Both UberGo and UberX offer uber services to customers who want to travel to their desired destinations in different cities in a convenient manner. However, there are glaring differences between the two and these should be understood by the riders so that they can make informed choices and make plans travel arrangements that do not inconvenience them. The following are key characteristics that differentiate UberGo from UberX. UberGo is a hatchback sedan with AC and is designed to carry four people seating comfortably. The vehicle has limited carrying capacity of large volumes of luggage. UberX on the other hand is a four seater sedan that is capable of carrying four people. The vehicle has the capacity to carry luggage since it has bigger space. UberGo offers services that are relatively cheaper since it is also simple. The services that are offered by UberX are comparatively expensive. The base charge for the first four kilometers is high compared to UberGo. The waiting charge is also higher compared to UberGo. UberGo does not offer extra facilities like wifi. This is one of the reasons why its services are generally cheaper. UberGo does not change from its original state and form. UberX offers extra facilities such as Wifi. The riders can enjoy activities like internet surfing while they commute to their desired destinations. For this reason, the service charges are comparatively higher than UberGo. UberX can change to UberGo by virtue of its versatile style and design. Its design suits both services. Over and above, it can be observed that Uber service is a convenient way of linking different destinations when you are in different cities across the globe where the service is available. As illustrated above, both UberGo and UberX are examples of UBER service cars that you can hire on demand should you require convenient services. However, to improve your travelling experience, you should also be aware of the differences between the two so that you can get the right service. As discussed, UberGo is relatively cheaper compared to UberX but it also has its own disadvantages. For example, the vehicles for UberGo are relatively smaller such that they cannot carry excess luggage. UberX can also act as UberGo and this is advantageous in that it the rider can choose it for different situations. Apparently, the major differences between UberGo and Uberx related to fares, facilities as well as type of car used. The fares are relatively cheaper for UberGo than UberX and the other issue that determines the price of fares is that Uberx has better facilities compared to UberGo. This information is very important since it helps the consumers to make informed decisions that will also not negatively impact on their travelling budgets. Trevor Mark. "Difference between Ubergo and Uberx." DifferenceBetween.net. December 7, 2018 < http://www.differencebetween.net/business/difference-between-ubergo-and-uberx/ >.